Marketing can sometimes be a fickle beast. Not only are there a number of marketing strategies to follow, but there are hundreds of different places that you can market. This is especially true when it comes to online marketing, which is where most businesses are placing their efforts in this day and time. That being said if you truly want to get ahead in today laden-market, you are going to want to market with videos. Videos will not only boost your conversions and sales, but they keep customers so engaged that that will come back time and time again. However, if you want to take advantage of video marketing, you are going to need a good program that all you to do just that. And, this is where Swish Video App will come in handy. If you are familiar with website creation programs like WordPress then you are simply going to love the simplicity of the Swish Video App. However, do not be fooled by the simple setup because this is one tool that can do powerful things for your website. That being said it does offer somewhat of a similar setup as WordPress. It already has pre-designed templates that you can use. Each template can be customized so that you can make it your own. You can change the text and write out any message that you want as well as choose the font and color palette. In addition to this, there is an extensive library of music that you can choose from or you can even add your own company’s jingle. There is no denying that video editing can be a long drawn out process sometimes, but this is where Swish Video App, one of the best video maker apps with both a DIY and professional feel to it, truly excels. It makes video editing efforts so much quicker and easier. With their full library of videos, you won’t have a problem finding a video that meshes with your brand. However, if you want, you can even import your own videos to put a unique spin on things. The software offers trim and fit clips so that you get the accuracy that you need. In addition to this, there are a number of filters that you can manipulate to change the video of your videos. Simply put, this is the only video editing software that you will need. Check it out here in the iOS store. Another unique thing about this editing software is that you can completely change the text and music in any video. Not only can you change the font and color of the text, but the software will allow you to add shadows as well as align and arrange your text. There are features that will really make your text pop. You can also take advantage of the many music files available or you can upload your very own creations. 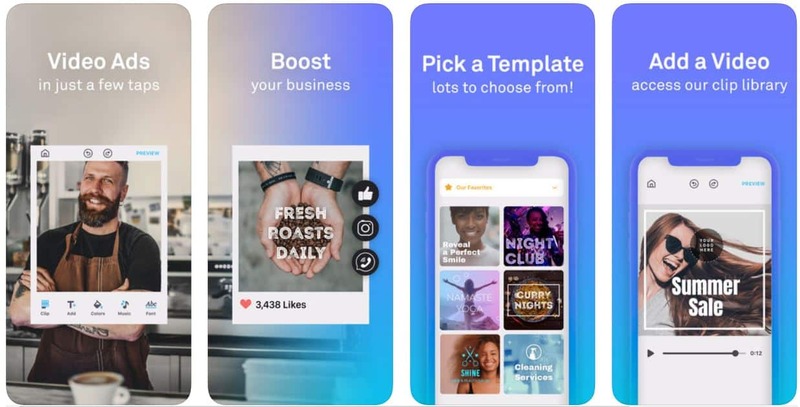 Social media marketing is extremely important today and Swish Video App is specifically designed to help businesses target social media. That software offers a portraits feature that really allows businesses to tell stories. These stories can really relate to your customers and appeal to their emotional side.